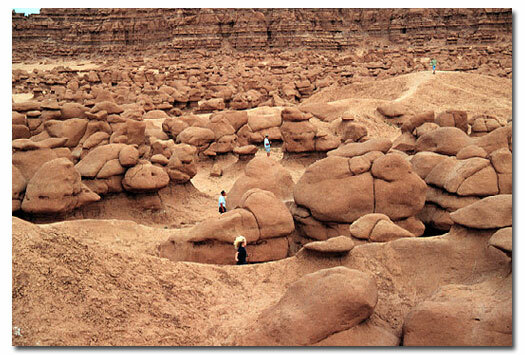 Goblin Valley State Park is inhabited by strange and unique rock sculptures, carved by wind and water, that suggest mischievous goblins and phantasmagoric creatures. It also contains colorful chocolate-colored balanced rocks, spires and pedestals amidst the solitude of the Great Basin Desert. The valley, which is only about a mile across and two miles long, is full of thousands of mushroom-shaped pinnacles a few feet high. These pinnacles are composed of large, orange-brown boulders of hard rock atop weaker sandy layers which have eroded more quickly. 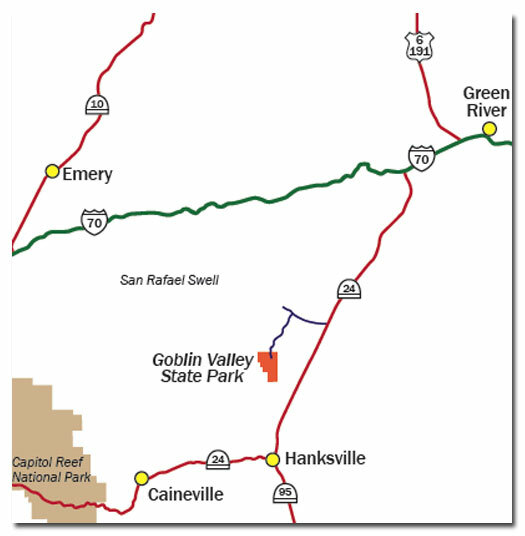 Goblin Valley State Park is located in Emery County between the towns of Green River and Hanksville. Follow Utah Highway 24 to Temple Mountain Junction and proceed 14 miles southwest on a surfaced and improved gravel road. The park encompasses 3,014 acres. 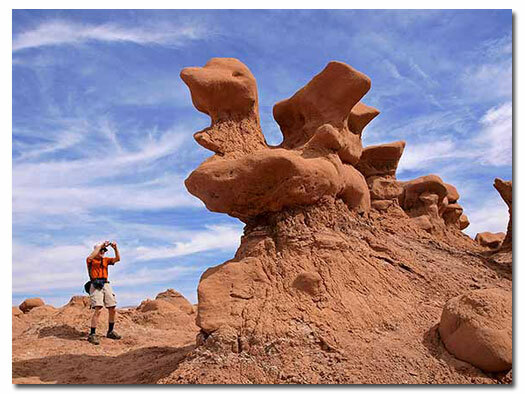 Secluded Goblin Valley was first discovered by cowboys searching for cattle. Then in the late 1920s, Arthur Chaffin, owner/operator of the Hite Ferry (a ferry used to shuttle people across the Colorado River), and two companions were searching for an alternative route between Green River and Cainsville. 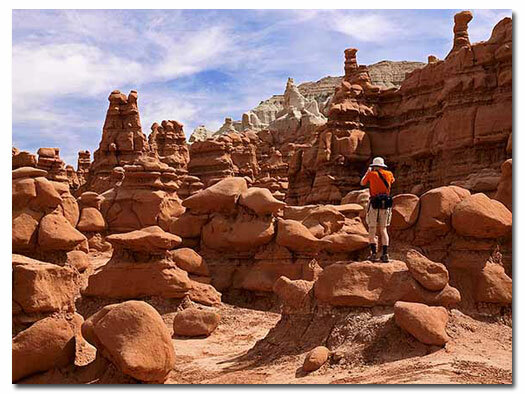 They came to a vantage point about a mile west of Goblin Valley and were awed by what they saw – five buttes and a valley of strangely shaped rock formations surrounded by a wall of eroded cliffs. In 1949, Chaffin returned to the area he called Mushroom Valley. He spent several days exploring the mysterious valley and photographing its scores of intricately eroded creatures. Publicity attracted visitors to the valley despite its remoteness. In 1954, it was proposed that Goblin Valley be protected from vandalism. The state of Utah later acquired the property and established Goblin Valley State Reserve. It was officially designated a state park on August 24, 1964. The park is located 50 miles southwest of Green River off State Highway 24. The Visitor Center is open daily from 8 am to 5 pm. However, during winter months (Nov - Feb), the Visitor Center may be closed for short periods while staff is away at lunch or on park business, and occasionally may be closed all day if no staff is available. Picnicking: An area with picnic tables, fire pit, barbecue grills and electricity is also available for picnicking and group outings. There is no lodging available in the park. Check Green River, UT for motel information. Back-in sites are available and can accommodate RVs up to 59 feet. No hookups. There is a sewage disposal station. Group Overnight Camping is available. Summer - Temperatures can reach to 90s to low 100s during the day and fall to the mid 60s at night. Afternoon thundershowers in late summer cool temperatures dramatically, but also bring danger of lightning strikes and flash flooding in nearby slot canyons. Spring and Autumn - Variable weather. Days are often sunny and warm, nights clear and cool. Be prepared for abrupt changes, including strong winds, rain, hail and occasional snow. Winter - Colder temperatures and occasional snow. Temperatures are above freezing most days, but often drop into the teens and single digits at night. Adjacent to the park, off-highway vehicle enthusiasts will find hundreds of miles of dirt roads to explore.The land west of the park, the San Rafael wilderness, is like much of southern Utah – it is remote and beautiful, traversed only by a few dirt tracks – 4WD vehicles are advised. 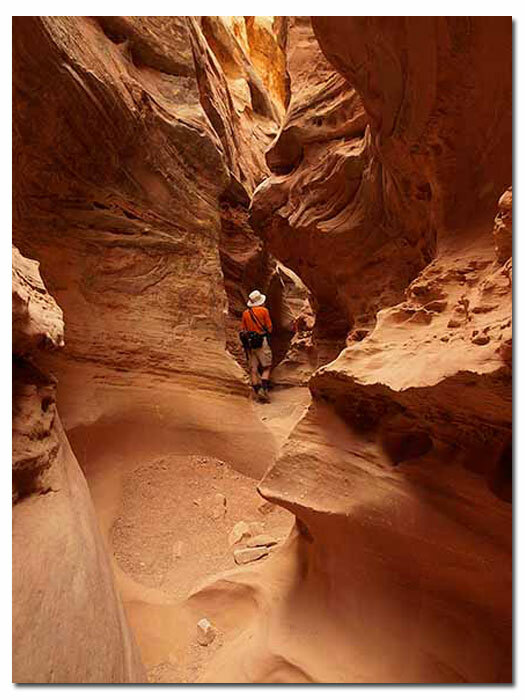 Carmel Canyon - A 1.5-mile moderately strenuous loop leading from the parking area to the desert floor. Along the way, visitors see Goblin Valley from different perspectives. Optional hike to Molly's Castle Overlook. Curtis Bench - A fairly easy 2.1-mile out and back trail that follows the Curtis formation. The trail offers a unique overview of Goblin Valley as well as spectacular views of the Henry Mountains. South of Goblin Valley, Little Wild Horse and Bell canyons cut narrow slots through the San Rafael Reef. A popular hiking route loop starts in Little Wild Horse Canyon and returns to the Little Wild Horse Canyon Trailhead via Bell Canyon. The hike requires some scrambling over large boulders and squeezing through narrow spots. Do not attempt this hike if there is a possibility of flash flooding. The trailhead, with its bulletin board, parking area and toilet is 5.3 miles south of the Goblin Valley entrance station. The dirt road south of Goblin Valley is rough, sandy, and subject to washouts. Grand Staircase-Escalante National Monument: 140 miles southwest. Green River State Park: 36 miles north. Anasazi Indian Village: 120 miles south in Boulder.